The road to Adventure lead to Newfoundland! 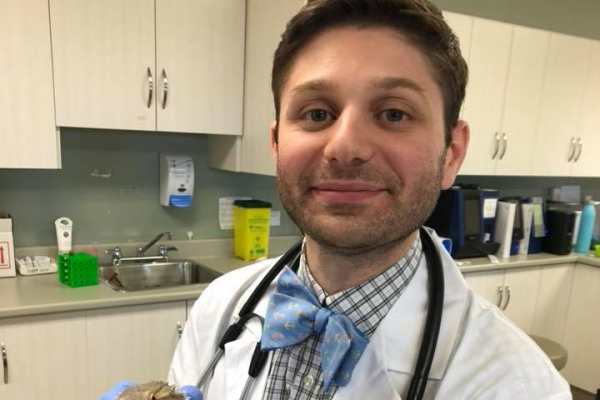 Aside from being a bow-tie enthusiast, Paul is a graduate of Auburn University in Alabama, earning his BS in Animal Sciences and his Doctorate of Veterinary Medicine in 2014 – so if you hear him say ‘War Eagle’, the Auburn’s chant, it’s just school pride and not some exotic species of bird he’s treating! Originally from the Hudson Valley area of New York, he’s followed the traveling bug from the Northeast to the Deep South, and now to Atlantic Canada. He has four wonderful doggies, who are pretty sure he exists just to answer their beck and call…and who take up most of his spare time – Dizzy and Dash, Cavalier King Charles Spaniels, Thatcher, English Setter, and Z, a Purebred American Mutt. Dr. Paul is also the proud husband of fellow veterinarian, Dr. Alicen Grant, who manages to get some of his spare time. He is thrilled to have moved to Newfoundland and discovered a place with such great food! Being someone who loves to read, hike, and explore, Newfoundland has also proven to be the ideal destination.